Time To Ride! Looking For a Challenge? 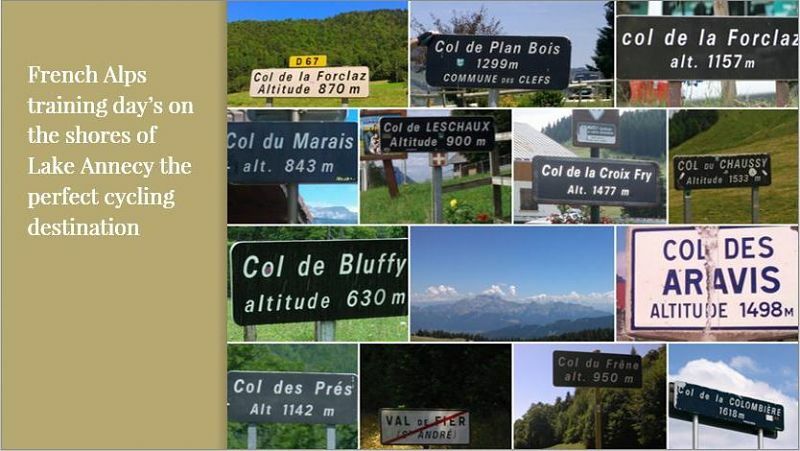 The French Alps cycling training cols all 20 of them are waiting to be ticked off the bucket list! It’s the ideal week to work on your cycling training, gain confidence with correct descending techniques and practice climbing optimally and efficiently. Information is one thing, knowledge is another put your information into practice on the road with the French Alps cycling training week. If it’s a question you need answering, Practice Bicycle Leaders include Paul Hughes your professional coach available to share his cycling knowledge with you. To get acquainted with your Alps cycling training, take in the scenery stretch the legs on the Cote de Talloires and continue the rhythm to the summit of the Col de Bluffy, perfect introduction to the exhilarating cycling week that awaits you. Today’s ride has everything for the experienced rider, false flat valley floors and a TDF Col (HC) if you are looking to test your legs in the Alps, this one is for you. Incredible alpine views all the way. Great cycling terrain all downhill towards the Rhone River, ideal route to turn the legs after the Cols. Finally some ‘flatish’ roads! Super views and bumpy terrain awaits you…with the perfect café stop on route to finish a great recovery ride. Roads of Le Tour race route including multiple famous TDF Cols as we take on the Aravis Mountain Range. Previously been used 40 times in the Tour de France, are you up to pedalling over 3000m in one epic ride day? The choice is endless, a variety of changing gradients through tiny villages hidden amongst the Grand Alps, this is terrain to challenge and improve your strength. Final challenge of your Annecy Summer Training Camp week in the Alps! Look out for views of Mont Blanc (4088m) at the summit, multiple switch backs with panoramic views of the Roc des Boeufs mountain range, the ideal gradient for a constant rhythm climb, don’t crack, don’t be too eager to push until inside the last 2km, these French Alps will bite you!